(Photo Courtesy/Mike Beiermeister) People take in artwork of all different types of mediums at the 'Winter Blues' exhibit. 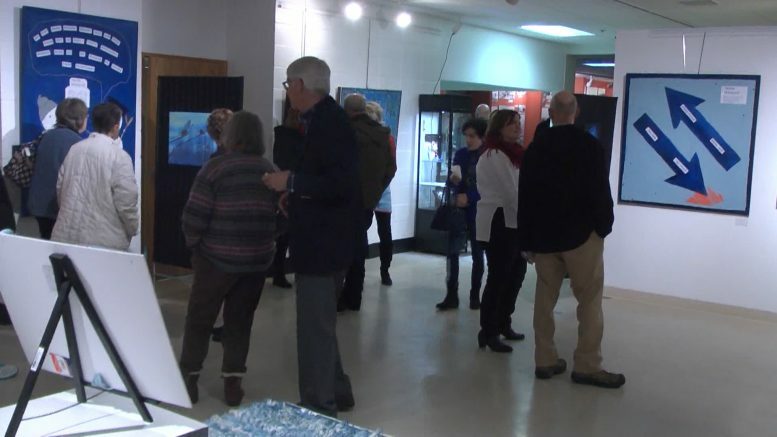 Alpena, Mich. — The Besser Museum for Northeast Michigan opened their ‘Winter Blues’ non–juried exhibit Wednesday night. The museum welcomed over 60 people in from the cold. It’s the second year for the exhibit, and the art work took on all different forms of blue. Artists could enter up to five pieces into the show. Since it was non-juried, the exhibit provides a unique opportunity for artists of all kinds and all mediums. “I’m always pleased to see that new and more artists and other mediums are being entered, and so it’s just really a place where they can feel comfortable to express their art,” said Witulski.